The big secret to success is Texan cities’ willingness to capitalize on their advantages through an extraordinary openness to growth….Houston’s famous willingness to build means that when new residents want to move in, housing supply quickly adjusts and prices stay low. ….That’s not how it works elsewhere. Beginning in the 1990s, rising incomes for skilled workers, especially in technology industries, made California’s cities more attractive. Strict local building rules made it difficult to accommodate new housing demand, however, sending prices soaring. Middle-class households have been only too willing to leave pricey San Francisco for affordable Houston, and that constant flow of people helped support the Texas economy through the recession. While construction employment is falling across most of the country, for instance, Texas added 24,000 construction jobs over the past year. Relocation into a city is good for the local economy, increasing demand for things like housing and consumer goods, which translates into new jobs that are conveniently filled by the newcomers. support economic growth for decades. During the tech boom of the late 1990s, Silicon Valley struggled to attract skilled workers thanks to soaring housing costs. 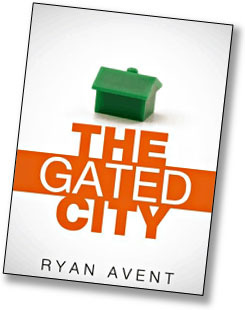 This is an abridged version of the argument Ryan makes in The Gated City, his new Kindle Single. I had sort of a mixed reaction to TGC, which I should probably put down in pixels fairly soon before I forget it completely, but that may or may not ever happen. In the meantime, here’s the nickel version. Roughly speaking, Ryan makes the case that cities are incubators of innovation and entrepreneurship and are therefore engines of economic growth. I buy this pretty much completely. His next step, however, is a little trickier: by restricting access to existing big cities (via zoning laws, NIMBYism, etc. ), he believes we’re also reducing our economic growth potential. My question here is whether correlation means causation. Yes, cities, by their nature, are more productive than rural areas. But does that automatically mean we want our current big cities to become as big as possible? Does productivity stay high no matter how jam-packed a city gets, or do we eventually get a similar (or better?) bang for the buck by keeping New York at its current size and directing urban wannabes to new cities like Houston and Phoenix? International comparisons of urban density vs. economic growth might be helpful here, though I imagine it would be something of an econometric nightmare. In any case, it’s an intriguing argument. At the beginning of TGC Ryan suggests that restrictive urban housing policy reduces measured GDP by a quarter percent or so. I’m persuaded that this might be the case, but his actual hard evidence on this score is a little thin. It’s also unfortunate, I think, that his solution to restrictive building policies sounds an awful lot like the libertarian dogma that any kind of property restriction is a “taking” that should be fully compensated by the government. That’s pretty tough to swallow. There’s more to life than simply letting developers build anything and everything that pops into their minds. But these are all half-formed thoughts. It’s worth reading the argument in full, and it’s yet another demonstration that the Kindle Single format has real potential. For two bucks, it’s a pretty good deal.